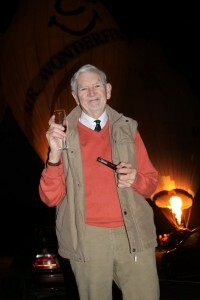 Joe Philp is an icon in the world of Old & Rusty balloonists. 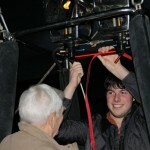 He set the bench mark when it came to flying, or not, and had a great way of giving completely contrary advise. Deep intake of breath, “Crikey chaps, doesn’t look good, those flags are going two to the dozen.” he would declare, drawing on his ever present pipe. That decided it for most and they’d pack up early and clutter off. That got the field down as far as the press were concerned and come the moment out would pop the little British Gas ’56 and a few moments later he’d be off across the showground. Chaos would then ensue as the remaining pack would thrash, burn and cajole their balloons into the sky in a valiant attempt to get onto the front page of the Chiselhampton Gazette but knowing they’d been pipped again. He went solo in 1971 and soon became a leading advocate of the sport. 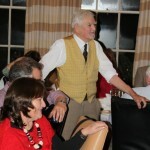 Always extremely polite and well-mannered, turned out in plus fours, yellow waistcoat, shirt (lightly checked squire-style), tie and sports jacket he was, and still is, the consummate country gentleman. Formally a successful National Hunt jockey, who’d managed to break every bone in his body, he decided to become a balloon pilot in the ‘very early’ seventies and was soon breaking records and bones again, on one occasion landing in a thermal and ending up colliding with a concrete post breaking his arm in several places. 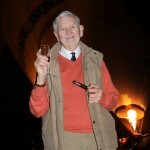 With only 50 or so hours under his belt he set the British altitude record in his AX6 balloon Dream Machine and went on to become one of the first balloon examiners. In 1979 Colin Prescot, who he’d checked out some years previously, asked him to join The Hot Air Balloon Company and become a full-time commercial balloon pilot. Colin had been taught to fly by Robin Batchelor. “A good pilot but poorly trained.” was Joe’s report. 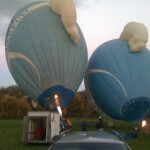 He was seldom seen flying anything else but the British Gas balloons supported by his wife Heather and it was always a delight to see their silver Montego with the British Gas trailer in pole position when you turned up at a County Show or event, a curl of steam coming from the biscuit tin. Tea was brewing. When the message came that Heather thought it might be a nice idea to celebrate husband Joe ‘Badger’ Philp’s 86th birthday with a bit of a get-together little did she realise what mayhem it would cause. Now, it just so ‘appened that Andy Rawson of Maltesers fame was already pondering a get-together for all those that used to be on, what was known as, ‘The Circuit’ so a rapidly growing list of contenders was already flying around the Interweb. The guest-list was sorted. Heather called Captain Ashpole, “Any idea where we could hold a ‘do’ for Joe?” “Hmmm,” thought Ashers, The Chase at Ross is nice and its close to home, “The Chase at Ross would be ideal, I’ll check it out.” He offered. Well from here on in it went bonkers. Andy Rawson checked his list and sent more reams of names to Heather. A mild swoon ensued but she pressed on. This would have to be kept secret from Joe otherwise he may be inclined to trot off to his London Club. That was going to be tricky. A choice of menu was ditched for a mandatory roast dinner. Giving pilots a choice would only result in confusion. 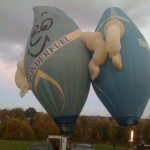 Andy R called us, “Do you think we could get Mr Flame inflated?” Blimey, we didn’t even know where it was. A few calls later and Tim Turner of the BBM&L told us that both the Flames that Joe had flown with such aplomb were in store at Pidley but G-BLKU was right poorly having a split that ran almost from the top to the bottom. Now I came to think of it following a small tear it somehow got ripped beyond economical repair as it was so porous it could barely carry enough fuel to inflate let alone fly! Undeterred, on the first decent dry day, Jane was dispatched to Cambridgeshire to collect them. On arrival they were already on a forklift and in seconds plopped into the trusty pickup. 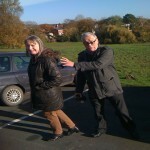 After a quick coffee from the very kind David Hopkins and she was soon back, a glorious sunny trip. Things were boding well. Unloaded in the workshop we pulled the envelopes out. 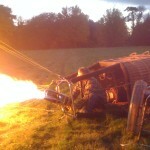 Mr Flame (G-BGOO) was a bit fried around the mouth and a couple of flying wires were missing, not too bad. It transpired that it had been successfully inflated at Bristol but hunting around Mr Wonderfuel (G-BLKU) soon revealed that it was pretty well mullered. Well, long story elsewhere, John set to and before you could get a hot water geyser up to heat they were both mended and declared fit(ish) to inflate. Time though was rattling on. 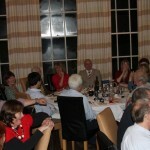 The Chase declared their facilities booked to bursting as it now appeared the local Rowing Club were holding their Annual Dinner that night and numbers were now seriously limited. Entries were deemed closed. By Friday evening we were ready to go and the trailer emptied, luckily as it turned out as we got a call to go and rescue youngest’s boyfriend whose recently acquired scoot had died at Amersham and someone had the pickup. No worries, we were soon back and a new vacuum hose fitted and the bonus being we now had an extra pair of hands to load up! Then Barry turned up, bad timing on his part. We were ready. Ashers would co-ordinate Joe’s arrival and Heather had gone into temporary hiding, head full of mayhem. The idea would be that they would pick up their son Joss, who had only been in a balloon once before and had no idea of his famous dad’s past heroic life or the dubious characters he mixed with, on the way up from Cornwall. Once they were close by, late(ish) Saturday afternoon, we would inflate the balloons outside The Chase and Heather would be called and would sedately arrive with Joe. Simple, we’d done this sort of thing a thousand times. The weather would be the weather but Mr Rawson assured us it would be dry and calm. It couldn’t go wrong. Saturday was glorious. We drove across the Cotswolds bathed in sunlight, the trees in full autumnal splendour. As we headed down towards The Air Balloon Roundabout we could see the Malverns as clear as a bell. As promised Rawson had organised the weather perfectly. What a professional. Meeting at the Park Gates to Captain Ashpole’s estate we were soon in convoy heading for The Chase. Just like the old days minutes later we were setting up, Jennie and Richard Turnbull’s basket was first over so he got the first envelope out of the trailer, Mr Wonderfuel. We ended up with Mr Flame (lucky). Amazingly old faces soon appeared all round and it was hands on. Ashers decided he would take pictures and co-ordinate. 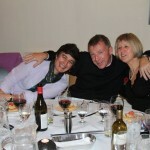 Whizz, his missus, was put in charge of champers. Thomas Wilson, better remembered by most as Tom Holt-Wilson, grabbed the mouth of Mr Flame, Rawson on Wonderfuel his missus sinking into the grass in heels and recently ‘done’ hair exclaiming “How Darling, darlings” the whole thing was. Blimey there was Lenny and Helen Vaughan as always pitching in, these days athletes partaking in some spectacular marathons and triathlons and Graham Elson with his missus enjoying life outside Spain but still sporting a respectable tan and The Alburys all windswept having zoomed up in their roofless TR4. It was like a scene from the Royal Showground. Lucius Peart and Sue Powell, stalwarts of HABCo (The Hot Air Balloon Company) and Flying Pictures days, organised non-existent passengers and the press who seemed to have missed the occasion, still they seemed happy enough glasses in hand. The signal to inflate was given and the balloons rose together, in unison even, and then we spun them round so they faced the right direction making it quite apparent that we could have done with Heather to tell us how they should have been rigged in the first place. Mr Turnbull got through his third cylinder and Ashers made the call. We realised that our ‘full’ cylinders had been tank-to-tanked so were only registering a healthy 30psi. The flame barely made the mouth. Nothing new there then. Now, the last time we had spoken to Heather she told us that Joe wasn’t quite a sprightly as he had been. So Ritchie and I awaiting his arrival expected him to dodderingly royally greet his guests and wave, all geniality, to us from the safety and firm ground of the car park. No such thing. Heather barely make the car park. With the car still moving he was out of the stalls like a champion steeple-chaser and heading, pipe smoke and sparks streaming over his shoulder, for Mr Turnbull in Mr Wonderfuel. He was all “Good grief” and “You heroes, what a treat” shaking hands and generally confused. Clearing the first fence he raced for Mr Flame. “Out Dunkley.” he ordered. I duly obliged in double-quick time, just missing a smart Dealer boot as he leapt into the basket. Now he was in his element. Pipe firmly clenched in teeth he asked “How high can we go on these ropes? Joss, get in.” Bouncing up and down to judge the lift in true Joe-style he was soon up and away his son Joss getting his first lesson. The downwind line was grabbed. Ashers got people into position, called the shots and was generally ignored. “Team Picture” called Ashers. Everyone gathered round Mr Flame’s basket including Ritchie Turnbull abandoning Mr Wonderfuel who promply started to collapse as soon as the burner was turned off. Fuel was now getting low and it was dark. We managed to get Joe out the basket by suggesting he would now need some more champagne and a ‘foreground shot’ was needed by Captain Camera. Eventually we convinced Lucius and Sue Powell that we’d had enough and required beer. Lush gave the order to deflate then remembered that the Central TV may be turning up so just another 5 minutes and headed for the bar. This was spookily familiar so we yanked the Capewells open. 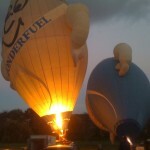 Mr Wonderfuel fell to the ground in a neat heap, Mr Flame was surprisingly reluctant. Rather un-pilot-like we were soon joined by man of mystery Cary Crawley, Nick Godfrey, who had just finished climbing Symonds Yat that afternoon, and a whole host of Old & Rusties including Malcolm (the Bear) Campbell and his carer Jane and in a trice we had the jolly giants packed up and back in the trailer. The Hotel and bar was now packed with very smartly dressed Rowing Club members but by sending Mr Dolby, our trusty crewman from days gone by, to the front of the queue we soon got a pint in and joined the rest of the early arrivals in the ante-room. Lovely. Dinner was set for seven-thirty so as change of apparel was needed by the early gathering of the faithful we all headed off. So far so good. I have never really been an advocate of re-unions but it walking into the Dining Room it immediately became very clear that this was not a re-union. 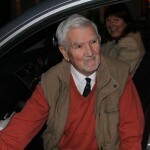 It seemed nothing had changed, it was a get-together after a flight from The Royal Show, the Bath & West or maybe a Fiesta and in true style, at least a quarter of an hour late, Robin Batchelor swept in gushing and loudly “Cripes, am I late? My map didn’t have the A40 on it.” As one came the reply “Yes Robin, sit down.” Full house. We joined the Rawsons, the Dorrel’s (who were staying in their trailer) and Thomas Wilson, taking a break on his Offa’s Dyke walk, on a table set for ten but with twelve somewhere below Top-Table. A quick scan revealed the likes of Mike Moore and family, the Camplins, Dave and Maria Partridge who used to run Air2Air. Fresh from Grand Canaria, Steve and Beverley Kinsey and fresh from a less exotic location, Jon Rudoni who abandoned his passengers the moment he landed and shot down from Shugborough. Political wit and general good bloke Blethyn Richards, he’d be good for a healthy discussion on Royalty later and a rare sight indeed, Colin Wolstenholme without a red hat along with Julia Bailey offering a good price on a new Mr Flame. There was some serious history in the room. It was clear that the night was, as yet, very young. The roast dinner itself was not spectacular but was partially saved by black pepper, horse radish sauce and the cheese-board. We just pretended it was on expenses and so didn’t matter. Ashpole gave a well-heckled speech. Joe responded with a story that back in the olden days he was sent to Scotland to fly some British Gas people. The weather was dreadful so he called the office and explained to Tessa Tennant, MD of HABCo and later Flying Pictures, that nothing was going to happen as it was 40 knots and gusting. Somewhat indignantly she told him that Ian had flown three times at Southampton. Joe pondered his pipe for a moment or two and suggested that ‘he’d better get up here then’. That set the tone for the rest of the evening. The stories and memories were flooding back. 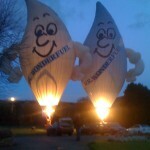 Mike Moore, who used to spend most of the summer in a tiny caravan or back of his van learning advanced French organising the balloons at all the major shows, was on truly good form. Days of trail ropes and hot air balloons, flying in fog, mishaps (mostly major) and sponsors and passengers from hell abounded. Then there was the story of the attempt by Mike Moore to throw a balloon into the air so it would go over the arena. Getting help from a passing Polish chap who spoke no English but smiled a lot, he duly heated it up, ran forwards with it and let it go. Somewhat surprisingly, he recalled, it ended up in a tree. 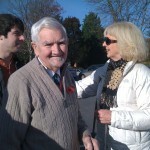 I asked his son James if he had flown with his dad. Only once, he explained, with two other pilots one of which went to hospital after the landing. Most ganged up on John Albury, who is probably best remembered for the Pritt Stick balloon and Chubb Fire Extinguisher, and quizzed him about his train set. 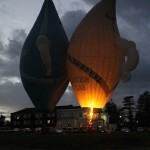 The British Gas balloon went to all the County Shows Joe’s favourite being the Royal Welsh. The year he retired, 1995, British Gas suddenly realised they had no mains gas in Builth Wells or the surrounding area and cancelled the venue. This was probably why he retired. 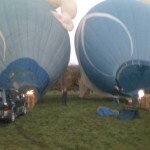 Trish Watkins took over the British Gas balloon and was rather dismayed when the Royal Welsh didn’t appear on the calendar! On the road Joe and Heather provided the NAAFI having a trusty old battered tin which Joe regularily ran over, containing a cast iron gas ring powered by the vapour take-off valve from a Worthington, one reason he never wanted to upgrade from a Colt C2 burner. HABCo were supplied with Russian Montegos, on account of the CCP numberplates they carried, for a while until they all died or were mysteriously damaged beyond repair. Everyone apart from Joe thought they were awful. For one season he drove around in his with the bonnet rather bashed and dented after the basket landed on it. Lucius explained that he continually asked him to get it mended but Joe explained that “I simply don’t have the time dear boy”. In the end it got a secondhand bonnet of similar colour. When he retired he bought the thing. As a founder member of HABCo he often found himself having to attend posh dinners, entertaining clients various. More often than not he would finish his grub rather smartly and head off to join the other teams in whatever hostelry or restaurant they had gathered, arriving pipe in hand. The tales went on and on, the laughter got louder and louder until the staff really truly honestly now had to lay for breakfast so, in true style, we all adjourned to the bar. From here on in things got a bit confused but we did end up drinking champagne until quarter past silly o’clock at the Ashpole family pile until his butler declared he was off to bed. Later that same morning the survivors met for breakfast, which was very nice. The sun was out and so were we. Gathering outside afterwards the jinks and japes and general mickey-taking of the previous evening continued. Early kisses, it transpires, is the first stage in saying goodbye. Many were made but the no-one seemed to want to leave. Several more group pictures were staged. 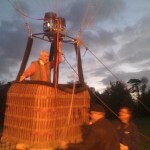 Joe appeared demanding to know why his balloon wasn’t inflated and ready for flight. Lucius Peart came under attack for having a footballers’ car and shades (Portsmouth Football Club). Blethyn asked Joe what he attributed his continued fitness to. 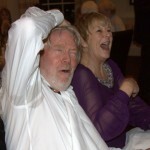 He was shocked to learn that Joe’s grandfather died of a heart attack age 93 whilst beating a shepherd. Following this revelation Joe wandered off down the front lawn in search of his balloon and blue plaque. Finally all the farewells that were going to be made were and as Mike Moore reversed (as badly as always) out of his parking space and rather regally sauntered down the drive it was remarked upon that he didn’t have a towbar. 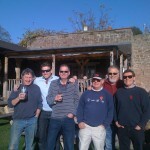 Rather responsibly it was decided to relocate to the White Lion for a final snorter. So it was that the final stragglers regrouped by the River Wye in glorious sunshine and quaffed local cloudy cider posing in front of Ashers’ live-cam screwed to the first floor window-ledge. We did all eventually get home but it was a reluctant departure only made bearable by the glorious weather still under the control of Mr Rawson. Fair play to him. 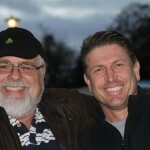 It had been a truly fantastic gathering and what a tribute to Joe Philp it left a big smile on everyones’ face. SIR,—I hope this is not rude, but I was very disappointed to see that you mentioned Jo Philp's balloon records, and you never mentioned mine earlier in the year. In your November 30 issue you describe Jo Philp's records of 11,300ft, 3hr 47min and 100 miles as world records for AX6-class hot-air balloons. They are only UK records, and to get them in perspective the relevant world records for an AX6 are 7,743m (approximately 25,000ft), 8hr 46min and 193 miles. 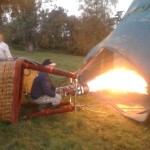 Also on July 14 I flew to 35,971ft in an AX8 hot-air balloon (G-AXVU) from Hereford, setting a new world record for AX8 and all larger classes of hot-air balloon. Confirmation from the FAI has just come and this is now the official record. 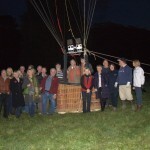 Airship Club chairman's report. This increase in new pilots has necessitated the appointment of three additional examiners, the total now being seven. In the interests of safety it was decided to use "approved instructors" with whom students must make at least two flights before being awarded a licence. Two notable flights were made by Club members in 1974: Julian Nott and his team gained a hot-air balloon world height record of 45,836ft, while Joe Philp achieved a National Altitude record of 25,110ft in his AX-6 Dream Machine.